Panax Ginseng has been a part of Chinese medicine for thousands of years for improving thinking, concentration, memory efficiency, physical stamina, athletic endurance and sexual performance in both men and women. Today, approximately 6 million Americans use it regularly. According to the National Institutes of Health taking Panax Ginseng by mouth can improve sexual function in men with erectile dysfunction. Men taking Panax Ginseng may have firmer, longer-lasting erections that are easier to attain. Panax Ginseng is also used for depression, anxiety, chronic fatigue syndrome, for boosting the immune system and others (for more information about medicinal usage of Panax Ginseng see this article from National Institutes of Health’s web site MedlinePlus). Each capsule contains: Panax Ginseng extract (20% ginsenosides) 350mg. Each bottle contains 90 capsules. Dosage: As a dietary supplement, adults take 1 capsule, 1 to 3 times daily with meals, or as directed by a health care professional. 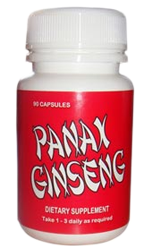 Warnings: Panax Ginseng interacts with many prescription drugs, foods and herbs. If you take medications talk to your doctor before taking Panax Ginseng.